Gone Girl is the first time I have ever seen Tyler Perry in anything unless his cameo in J.J. Abrams’ first Star Trek still counts even if I had no idea he was in it when I first saw it. Other than that, I have somehow gone all this time without ever seeing one of the Madea films or any of the one-offs which may or may not actually star Perry but all come with title pre-fix Tyler Perry Presents. I knew he had more serious ambitions beyond Madea, what with having produced Precious, and that he was supposedly among the handful to be truly deserving of the description “hardest working man in Hollywood.” I just didn’t really know what kind of actor he was. It turns out he’s a good one, possibly great, at least based on his ability to consistently steals scenes and deliver some of Gone Girl’s best lines while playing the high-powered attorney Tanner Bolt. Gary Dowell’s DarkHorizons.com review of the film pretty well sums up the critical response to Perry’s performance: “Tyler Perry finally proves that he can indeed act and be funny without playing to the rafters in drag.” Of course, as I’ve already said I’ve never actually seen Perry in drag, but I have seen in him Gone Girl. I can confirm Dowell’s conclusion there: Perry’s brilliantly hilarious but not distractingly so, probably leaving many a viewer completely unaware they’re watching the guy otherwise known as Madea. What the heck is doing in it, though? 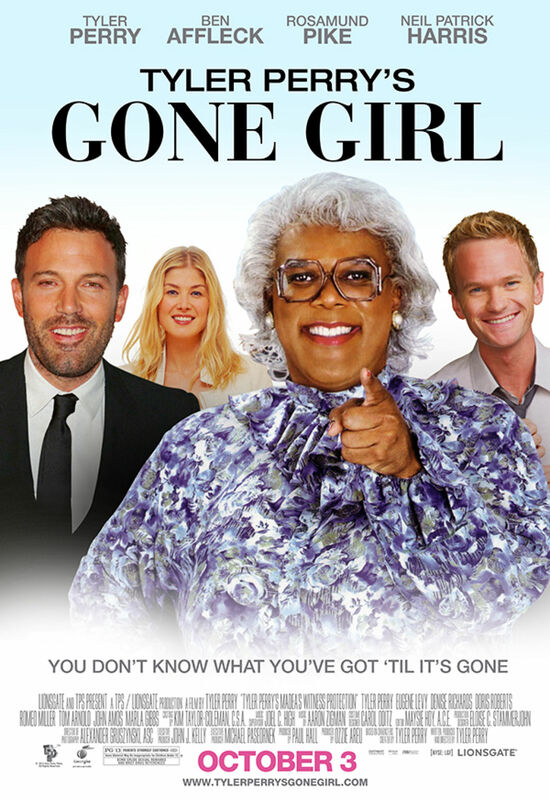 How did Madea-wig wearing, production company-running, screenplay-writing Tyler Perry end up in Gone Girl? How did he even find time what with the so-many-we’ve-lost-count films and TV shows he has going at any given moment? Cut it out right now with these parody posters, internet. Tyler Perry’s great in this movie. Tyler was someone that I had met in real life, not under the auspices of writing, directing, acting, or producing. He has this great film studio in Atlanta, Georgia, and I was down there scouting soundstages for Curious Case of Benjamin Button. We drove up to meet him, and I saw him standing on the roof of this 3-story structure with a radio-controlled airplane, just flying it around. I remember one of his many assistants came up to me and in this incredibly business-like voice said, “Mr. Perry will be with you in a moment.” That’s Tanner Bolt to me, “I’ll be right with you after I finish flying this RC plane.” Like Bolt, Perry is a multi-processing individual. If you need him on set at 5 AM he’ll arrive at 4:15 AM, and he’ll be in all the meetings. However, he’ll always have his Ipad on him, he’ll always be writing a screenplay or something, just always going. So, I sort of walked him through it, told him, “I want you to play this sort of super star attorney.” He laughed, and then he asked, “Are you sure?” When I said yes he was still a bit cautious, “Okay, let me read the script, and if it’s good let’s do a read with the cast to see if I’m any good.” So, we did a reading on Skype with all these people reading all these parts. The clincher, as it turns out, came from Ben Affleck, who told Fincher after the script read-through, “Oh my God, Tyler Perry is going to kill this movie.” Sage words, back tattoo enthusiast. Sage words. And that, kids, is how Tyler Perry ended up in Gone Girl.